In a medium bowl, whisk together flours, baking powder, baking soda and salt. In another medium bowl, whisk together buttermilk, milk, honey, eggs and oil. Pour mixture into the dry ingredients and stir just until combined. 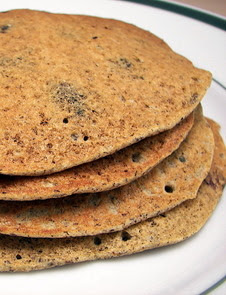 Fold in berries or set them aside and sprinkle them on top of each pancake while they cook. Scoop a rough 1/4 cup worth of batter per pancake onto a hot nonstick griddle. Flip the pancake when it is golden brown on the bottom and bubbles are forming on top, about 1 1/2 minutes. Cook the other side until golden brown, about 1 1/2 minutes.